Please pardon this brief personal anecdote. I promise it is relevant to the hike. 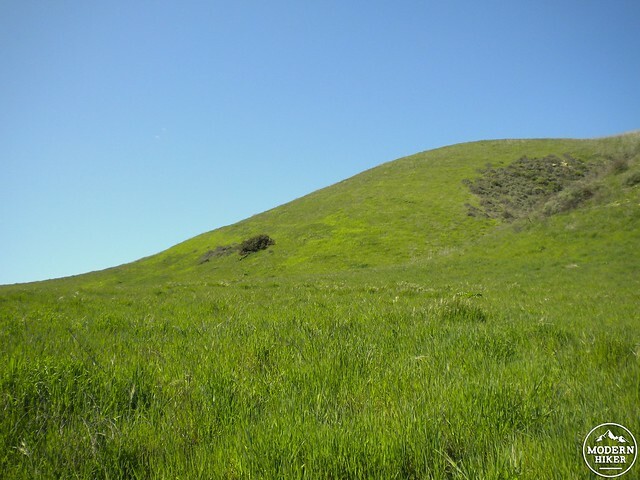 Agoura Hills – this author’s hometown. Ladyface is the mountain on the left. Sandstone Peak and Boney Mountain are in the distance on the right. 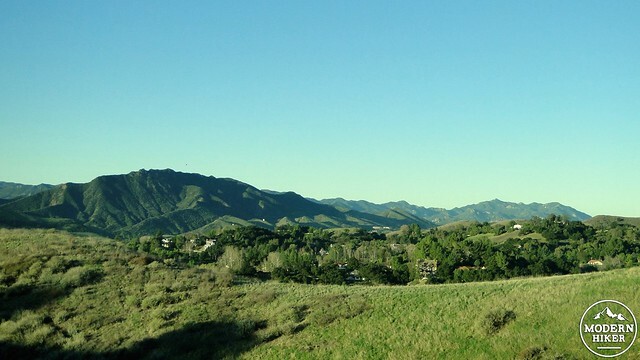 I spent a considerable part of my childhood and early adulthood living in Agoura Hills. During that time, I developed a pretty strong attachment to the place, even though I outgrew the specific charms of this quiet bedroom community by early adulthood. A regular feature of my childhood was playing alongside the local creek, catching crawdads, building forts in an oak grove, riding bikes along old fire trails, or climbing up the big hill behind my parent’s house. This was a regular feature of my life, and this experience is a considerable factor leading to why I still like to do the same things at age 36. Over the years, much of this land has succumbed to development to the point where place names like Thousand Oaks, Woodland Hills, Sherman Oaks, and Encino (Spanish for oak tree) now seem quaintly irrelevant. The place where I built forts is now a Costco, and much of the creek is now fenced off as part of private property. As the town has changed, so have I. I now reside in San Diego County, and I usually cover that region, Orange County, and southern Riverside county for Modern Hiker. However, I go back up to Agoura to visit friends and family often, and when I do, I usually hit the old favorites, such as Sandstone Peak, La Jolla Valley, Topanga Canyon State Park, Sycamore Canyon, Danielson Monument, Castro Crest, and Malibu Creek State Park. 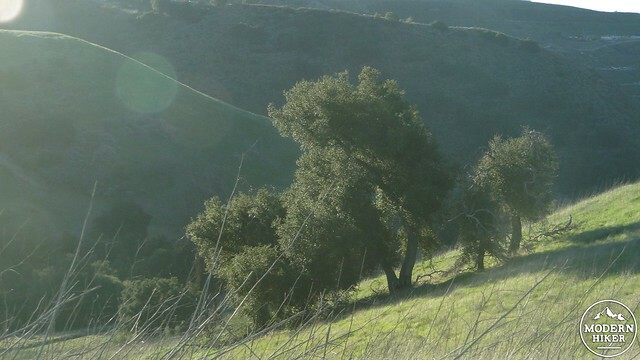 However, the one old favorite that stands out above all others is the northern extension of the Santa Monica Mountain Recreation Area that protects Cheeseboro, Palo Comado, and Las Virgenes Canyons. These canyons still preserve the classic image of coastal Southern California. 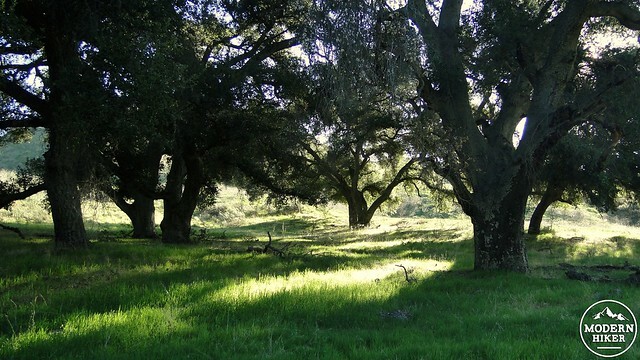 Gently rolling hills that turn a vivid Irish green after a rainy winter divide long, tranquil canyons containing beautiful woodlands of coast live oak, sycamores, willows, and the king of all oak trees, the valley oak. 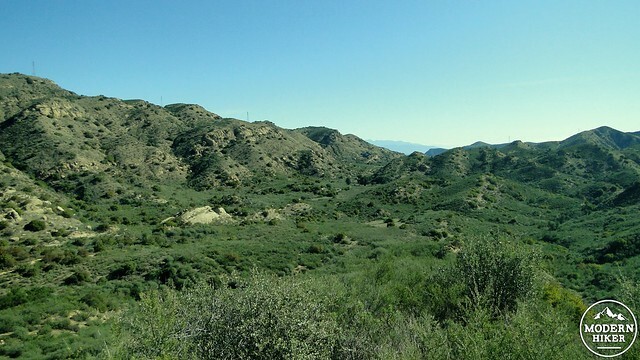 It is a vision from the past of what most of the Conejo Valley and San Fernando Valley once looked like, and fortunately for the public, the National Park Service maintains an extensive and popular network of trails throughout this region and the nearby Simi Hills. 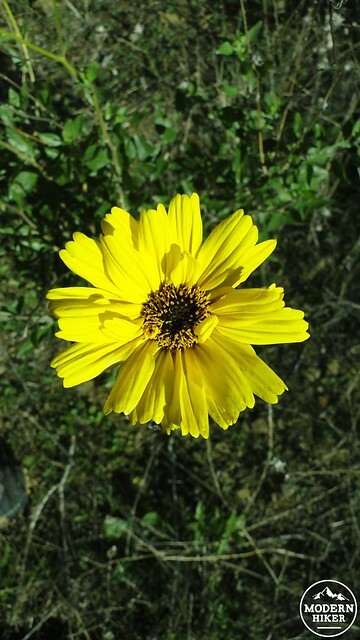 This trip, which features numerous options for easy to difficult loops, explores most of Palo Comado Canyon and the full extent of Cheeseboro Canyon. This write-up will provide directions for four separate loops with a common starting and ending point that cater to people of varying conditioning and ambition. Starting from the main staging area, walk past the wooden fence toward a small trail leading away from the main trail into Cheeseboro Canyon. This is the Modelo Connector Trail, and it will take you to the Modelo Trail that runs along the ridge dividing the two canyons. The Modelo Trail will ascend into a small ravine and wind its way up to the top of the ridge. 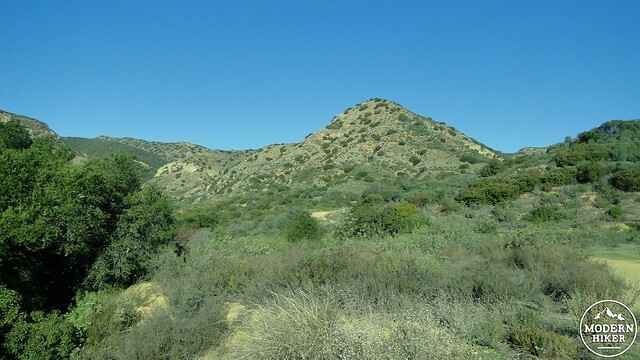 Once on the ridge, you will come to a junction with the Modelo Trail continuing on your left, a use trail leading off to the edge of the ridge on the right, and another trail that drops down into Cheeseboro Canyon. If all you have time for is this brief 1.3 mile stroll, take the route into Cheeseboro Canyon and turn right onto the fire road at the bottom. This will bring you back to the staging area. While you are here, stop for a bit and take in the view around you. 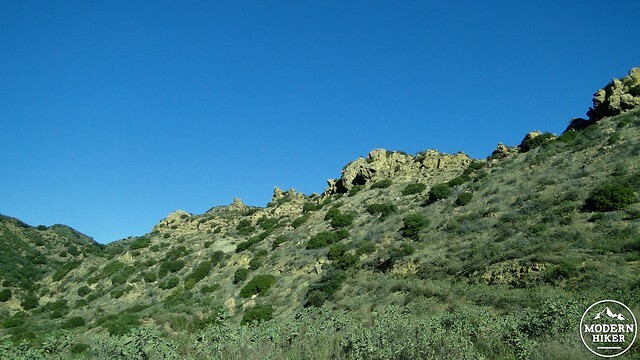 To the west, you’ll see the town of Agoura Hills, along with some of the more notable geographic features in the area, including Castro Crest, Ladyface Mountain, and Sandstone Peak. To the east, you will see the unfortunate terraced hillside indicating the presence of the Las Virgenes landfill. You may also spy the rounded summit of San Gabriel Peak and the flattened antenna city atop Mt. Wilson off in the distance. Should you wish to continue on, follow the Modelo Trail north as it undulates along the ridgeline. At 1.2 miles, the trail will reach a T-junction. The right turn will lead back down into Cheeseboro Canyon where it will junction with the fire road. If you’re looking for an easy loop, you can turn right, drop into the canyon, and turn right onto Cheeseboro Canyon’s fire road to return to the staging area for a 2.8 mile loop. 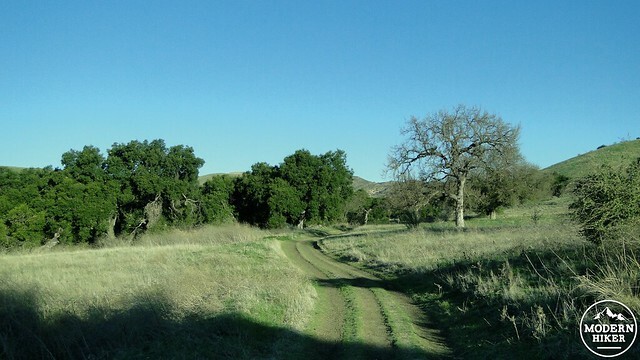 Turn left, and you will traverse the widening ridge to the outlet of Palo Comado Canyon at about 2.2 miles. The trail will undulate some more before dropping along a wooded slope. You’ll pass private property on the left before reaching a junction with Palo Comado road. The paved portion of this road continues behind a gate on your left, but you will turn right to commence your journey up-canyon. 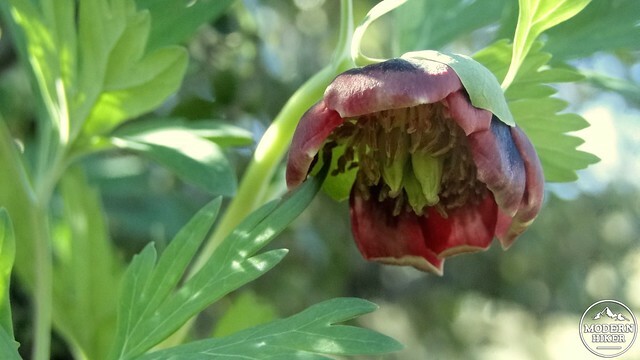 Immediately, you will plunge into a classic woodland of both coast live oaks and valley oaks. To the casual observer, it can be a bit of a challenge to tell the two trees apart. If you look carefully, however, you will notice that the coast live oak has thicker foliage that is a much darker green. They also tend to grow smaller than the valley oaks. Valley oaks have much sparser foliage, and since they are deciduous they will lose their leaves from December until April. Their leaves have an intricate lobed shape, whereas coast live oak leaves are folded kind of like a taco shell with tiny spikes around the edge. Valley oak on the left of the frame. The tree on the hill in the background is a coast live oak. The valley oak deserves a little more attention here. I called it the king of the oak trees because it is the largest and longest-lived oak tree in the United States, and possibly the world. 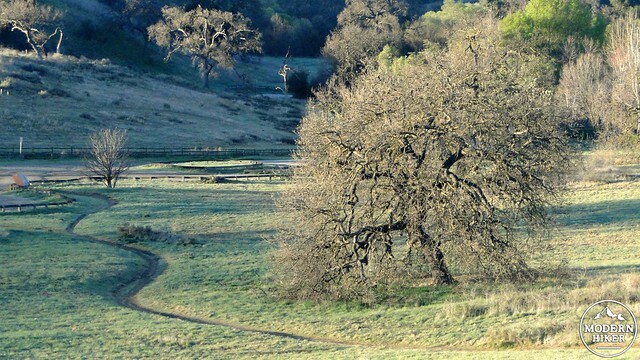 This oak, which is called “Roble” – a la Paso Robles – in Spanish, grows in wide, flat valleys that have dependable sources of sub-surface water. This massive tree, which can reach 100′ in height and live up to 400 years, sinks its considerable root system deep into the water table and grows to dominant heights relative to other trees around them. 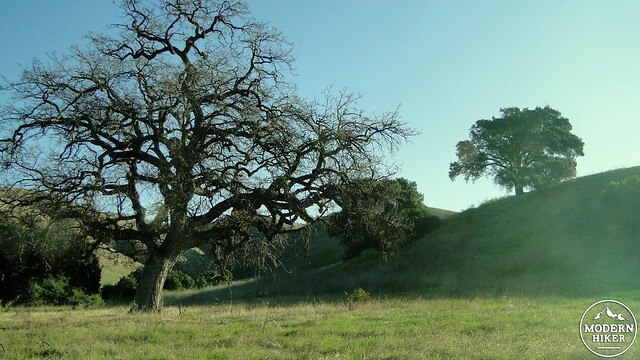 Valley oaks reach their southernmost extension around Calabasas, but they are common along the Central Coast and San Joaquin Valley. City ordinances in the Conejo Valley prohibit disturbing valley oaks, and it is common to see shopping centers or office buildings built and landscaped in such a way as to accommodate these grand old trees. Palo Comado Road continues on in this manner for 1.6 miles before the canyon walls narrow and the ecology transitions from woodlands and grasses to a much drier mix of chaparral and yuccas. Right before this point at 3.3 miles from the start, you will reach a junction with Ranch Center Road, which will traverse the ridge separating Palo Comado from Cheeseboro Canyon. 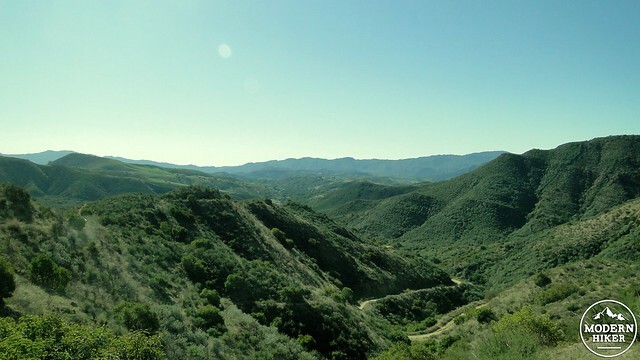 If you are looking for a moderate loop, take a right here, cross the ridge, and drop down into Cheeseboro Canyon where you can turn right on the fire road to return back to the start for an approximately 7 mile loop. 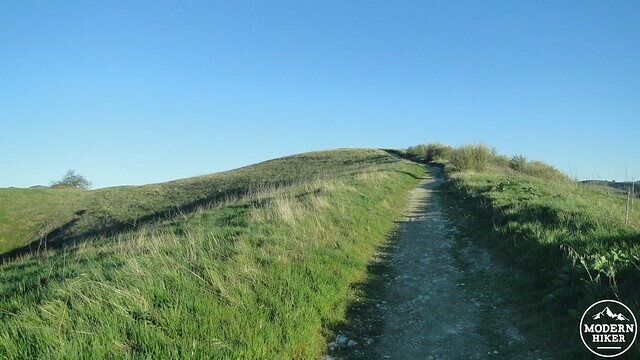 Should you elect to continue for the full loop, you will begin a moderate and steady ascent up through much drier and rockier terrain as you reach the “back” of Palo Comado Canyon. Palo Comado Canyon actually veers off to the left and continues up to its headwaters at China Flats, but you won’t make it that far on this trip. Instead, you’ll reach a junction with the Shepherds Flats Trail branching off to the right. Turn right and commence climbing over a ridge. Right before you reach the apex of the ridge, you will come to a viewpoint off to the right. With this being roughly the halfway point of the trail, the viewpoint is a great place to eat your lunch and rest while you enjoy views of the Santa Monica Mountains. From this vantage, the range’s “Backbone” is very apparent. 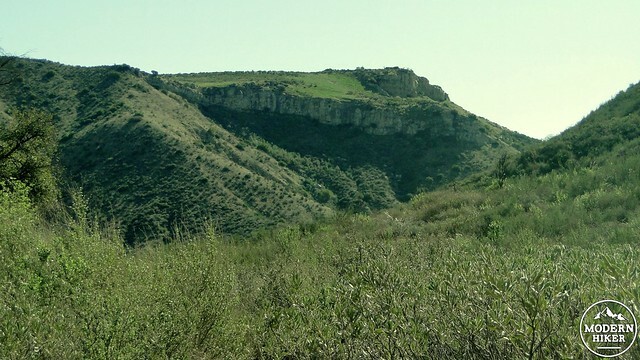 Continuing on, you will pass over the ridge and drop down into a secluded, dry valley that contains Shepherds Flats, where sheep herders once stabled their sheep. This enjoyable stretch features some great wildflowers in spring, but mountain bikers can become a bit of a hazard through here. It is not so much that the mountain bikers are dangerous or reckless – most of them are pretty considerate – but there are a lot of blind turns where neither hikers nor mountain bikers can see each other and get advanced warning on who is coming toward them. As mountain bikers tend to move a lot faster and cannot hear nearly as much of what is happening as hikers, it is wise to remain vigilant on this stretch to avoid any unpleasant encounters. 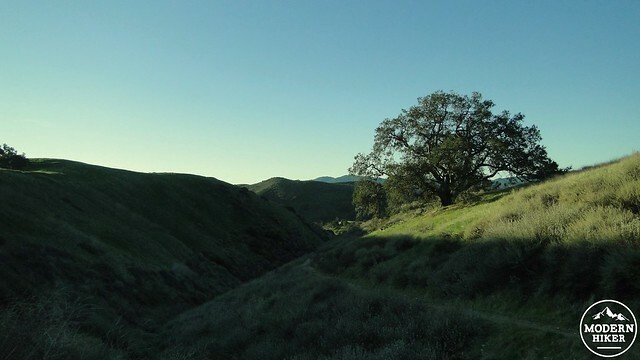 This trail will come to a junction where you can continue straight to Las Virgenes Canyon and the Baleen Wall Trail, but you will turn right to return via Cheeseboro Canyon. From here, the route is pretty simple. You will continue along this trail as it transitions from the drier, rockier terrain into the grassy woodlands you first encountered. There are a couple of notable spots along the way. The first is Sulphur Springs, which you can visit by taking a brief side trail that branches off of the main trail to the right at around 7.5 miles (reckoning by the full loop). Provided there has been some recent rainfall, you may catch a whiff of rotten eggs, indicating the presence of sulphur, and therefore some extremely minor volcanic activity, close to the surface. Continuing on through more woodlands and creekside vegetation, you will come to another junction with a service road that branches off to the left. You can take the service road if you want, but it is exposed and ugly. Keep to the right to stay in the trees for what is probably the finest segment of woodland in this canyon. After this, it’s a simple matter of continuing your walk through the woodlands until you come out into an open space with a bunch of planted valley oaks on your left. This is the sign that you are reaching the end of the hike, and the staging area will be about another 1.1 miles ahead. For me, this is where I go when I want to get the full blast of nostalgia for the place that helped me fall in love with outdoor Southern California. We are lucky that the state and federal governments saw fit to protect this area early on. These narrow, grassy canyons would have been ideal for high-income suburban homes, much like the homes in the Old Agoura area. Instead, they have been preserved for perpetuity, guaranteeing that not all of this beautiful landscape will succumb to the bulldozer. The trail occurs almost entirely on well-marked, easy to follow fire roads. The single-track through Sherpherds Flats gets a little nerve-wracking due to heavy mountain bike traffic, which can occasionally sneak up on you from around a corner. Additionally, the trail becomes a muddy mess after a good rain storm. 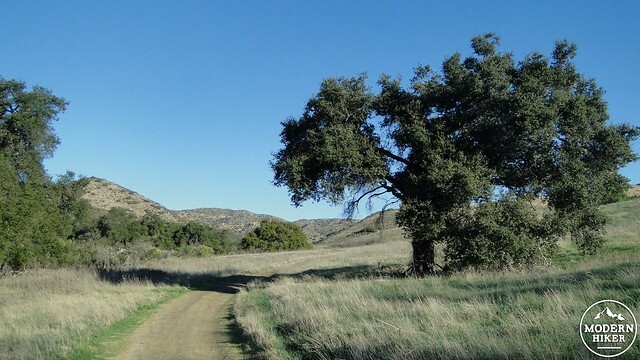 The nearest camping is at Malibu Creek State Park's campground. Exit Highway 101 at Cheseboro Canyon Road, and travel north on Palo Comado Road. Turn right on Cheseboro Road and continue north for 0.7 mile. This write-up really hits home for me. I grew up in Agoura, left during my youth, and came back to raise a family here. I have hiked nearly every trail in the Santa Monica Mountains but I always go back to Chesebro a few times per month. It is my "go-to" place. When I NEED a quick "hiking fix," this is where I go. Depending on how much time I have, I usually do the 7-mile loop you mentioned - sometimes the 3-miler if really pressed for time. This is also where I go when I can't find anyone to join me and I head out alone ... it's remote enough that you feel the peace of the park, but used enough that there is some safety in numbers. Another great loop option is to park near the trailhead on Doubletree in Oak Park. We did that last week: Doubletree connector to Ranch Center Rd to Chesebro to Sheep Corral to Palo Comado and back to Doubletree. Fabulous 7.5 mile loop with everything you mentioned at the top of the hike. It's a great write-up .... but the nostalgia you mention is what really got to me. I totally understand! Nice post, looking forward to it now! This is beautifully written. Definitely on my hike to-do list now.